Swati is a maximizer. She encourages her clients to achieve optimal performance, productivity, relationships and sense of being. This all comes from creative and deep self-inquiry, no-holds barred awareness development, and activation of her client’s courageous selves. Swati’s clients are often juggling multiple priorities — start-up businesses, partners, children — all the while wondering how to remain present-minded and prepared for the future — both at the same time. Previously a business executive, Swati is now an experienced Mental Health Therapist, Coach and Facilitator. She believes strongly in her “Purpose Squared” approach — living with purpose, and on purpose in order to gain exponential returns. This includes unearthing the true meaning tied to our experiences and making conscious, intentional choices in our lives. She’s not interested in breezing through our days, or going through the motions. Each day provides the opportunity to live deeply and purposefully. Swati is here to help. Utilizing proven therapy methods along with executive management skills, Swati assists her clients to walk taller, see clearly and take action. She believes in cultivating meaningful relationships, maximizing potential, developing awareness and challenging assumptions. Working co-actively, Swati helps her clients close the gap between where they are and where they want to be. She holds them accountable to what they say is important to them. She supports. She challenges. She cheerleads. She gives the honest truth. Specialties include life management, family and work planning, executive coaching, team building, the creative process, empowerment and diverse communities. She has extensive training and experience working with multi-cultural and LGBTQ communities. She also specializes in relationships, often working with both members of a couple or business partnership at the same time. Swati was immersed heavily in the integrated marketing movement. She was responsible for gathering various entities with different deliverables and financial goals, and aligning them in a clear and unified mission for their shared client. Swati worked with big brands, and their global teams. She shunned the notion of finding the lowest common denominator to please everyone, and instead aimed to create work that was inspired and meaningful for everyone involved. She brings this strategic, personal and pragmatic approach to her coaching. She clearly identifies individual, partner, family and systemic goals, and redefines our definitions of success. Swati’s path to executive coaching also includes her Licensure as a Mental Health Counselor – her practice in mental health gives Swati the insight to truly understand when clients are dealing with something deeper than the coaching at hand, and to facilitate the appropriate support team. Swati holds dual masters degrees from Columbia University in New York City — an M.A. in Counseling Psychology and an Ed.M. in Counseling for Mental Health and Wellness. She has a B.B.A. with concentrations in Business Marketing and Advertising from James Madison University. She is a Certified Professional Co-Active Coach (CPCC) through the world-renown Coaches Training Institute, and a Licensed Mental Health Counselor (LMHC) in the State of New York. Swati is an accredited practitioner of the Myers Briggs Type Indicator (MBTI) Step 2 assessment and the Strong Interest Inventory. Swati regularly trains therapists, coaches and professionals, including guest lecturing at Columbia University and providing workshops to professionals focused on balance and self-care. 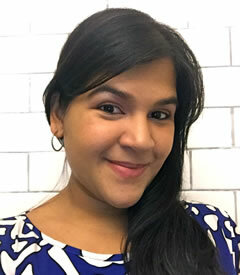 Swati meets with her clients via phone, video and in person in her New York City office on the Upper West Side. Currently, she is working with a number of entrepreneurs — individuals and business partners; attorneys; creatives, directors and musicians; marketers and publishers; parents, couples and individuals.